Congahead: On the Scene: Samuel Torres Performs "LPMania"
On October 13, 2004, Samuel Torres visited the LP Studio to record "LPmania" for the 2004 holiday CD, where he showcased many of the percussion instruments from the LP® catalog including congas, djembe, cajon and miscellaneous small percussion. 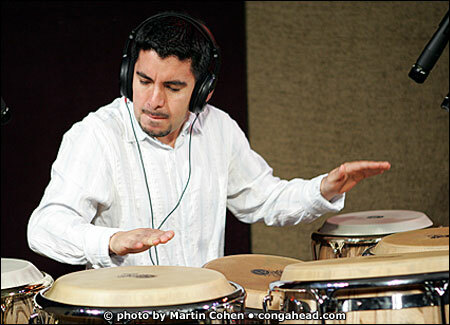 Colombian-born Samuel Torres is not only a virtuoso percussionist but a skilled composer and arranger. His contribution to the upcoming holiday CD contains an original composition to which he overdubbed percussion parts. Samuel was the creator of LP's instructional DVD "Drums Solos Revisited." Watch for Samuel's forthcoming CD!